Born to a Scottish father and a Chinese mother, Troth Montgomery dreamed of someday traveling to Scotland, until the death of her father condemned her to a shadowy life as an interpreter in Canton. Then Kyle Renbourne, viscount and adventurer, discovers Troth's true identity and persuades her to be his guide on a dangerous journey into the heart of the Celestial Kingdom. A meeting of the minds flares into searing passion, an idyll that ends when Kyle is captured and condemned to death. A reckless prison cell marriage the night before his execution sends Troth to England, where she arrives at the estate of Kyle's brother. Though accepted as bride and widow, she is haunted by the memory of her dashing husband. Then the past reaches out to Troth, bringing passion, despair, and danger. 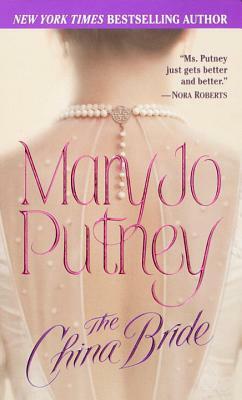 Now she must draw on her unique heritage to save all she holds dear--and become the woman she is destined to be. . . .
A New York Times, Wall Street Journal, and Publishers Weekly bestselling author, Mary Jo Putney is a graduate of Syracuse University with degrees in eighteenth-century literature and industrial design. She has won numerous awards for her writing, including two Romance Writers of America RITA Awards, four consecutive Golden Leaf awards for Best Historical Romance, and the Romantic Times Career Achievement Award for Historical Romance. Her books have also received frequent awards from online reader sites such as The Romance Reader, All About Romance, Romance Readers Anonymous, and Under the Covers Awards. The author of twenty-four novels, Ms. Putney lives in Baltimore, Maryland. "MARY JO PUTNEY IS NOT TO BE MISSED!" "PUTNEY [IS] ADEPT AT ATMOSPHERE, PACE, AND EROS."